It’s been a little over a month since our last update. Everything has been going quite well! Tyson was at Burke Rehab for 2 1/2 weeks and did very well there. Cal and I visited him every day and sometimes twice on Saturdays and Sundays. What Tyson noticed the most while he was there was the improvement in his core strength. He didn’t do much walking, however they stood him up every day and that alone contributed to his core strengthening. The therapists at Burke tend to focus on strengthening the larger muscle groups as opposed to the smaller, finer muscles. It’s wonderful that he’s able to work both groups between here and India…so together, he’s getting what he needs. Once he was discharged, we took him to a different building at Burke for his out-patient PT and OT evaluations so that he could continue his therapy. His physical therapist at out-patient, Grace, hadn’t seen us since before we left for India in July. She asked if we had noticed any changes, good or bad since we last met. We told her that Tyson’s biceps were stronger and that he was feeling slight contractions in his calves. We explained that toward the end of our trip, Dr. Shroff had set Tyson up so that he could try to roll over from a lying down position with one leg bent. I told Grace that although Tyson was unable to roll over, Dr. Shroff noticed his muscles firing and said that she could see his body attempting the move. So, for curiosity’s sake, we set him up exactly as I had described it to see what Tyson could do. He not only rolled over…he rolled about 5 times on each side! It was so exciting and he yelled out, “I wasn’t doing this before, Annie! !” Such a great moment. So, improvement is continual as is our hope and determination. We leave for India on Monday for another 6 weeks returning October 30th…just in time to spend Halloween with our little man! We are very excited to see our “family” in India and resume the stem cell therapy!! Naturally, we are heart broken to be away from Calvin for so long- but he is in excellent hands and we will do FaceTime with him every day to keep in touch. This weekend has been very special. 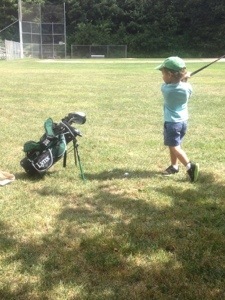 We spent a few hours at the park across the street with Calvin where he hit between 100-200 golf balls. He is so amazing!! Tyson coaches him just by talking with him and explaining everything (sometimes Tyson had me step in to show Cal specific things). He hits the ball around 35 yards now! Today, Tyson had me put a target out in the field for Calvin to have something to aim at and we were shocked at how many balls he hit close to it! He even hit it 3 times. Every morning when I wake up and every night before bed, I do a mental checklist of all of the things I am grateful for: my husband, my son, our health, our families and friends…and just an overwhelming sense of gratitude for the opportunity to continue to pursue the only treatment that has worked for Tyson. We are so happy!! Tomorrow will be another cozy and loving family day as we pack and do some final preparations for our trip. We will sneak in some outdoor time with Calvin and give him a million kisses. 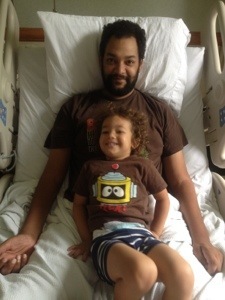 As always, I thank all of you for your thoughts and prayers as we get ready for our third round of treatment in India. I will keep you updated every step of the way! Ann! I’ve been reading this and so impressed with how well Tyson is doing and I can’t help but think what an amazingly supportive wife you are 🙂 I see Cal playing a little golf – Jake likes to hit the ball now and then too – he had a little set back when he broke his arm over the summer but we still like to play. When you get back let me know and we can do a little playdate across the street from your house. We live in Glenville and drive by your house on the way to PAC. Miss you and hope to see you soon!! !